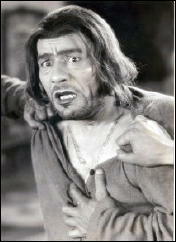 » A Movie Review by Walter Albert: MOCKERY (1927). A Movie Review by Walter Albert: MOCKERY (1927). MOCKERY. MGM, 1927. Lon Chaney, Ricardo Cortez, Barbara Bedford, Mack Swain, Emily Fitzroy, Charles Puffy, Kai Schmidt, Johnny Mack Brown. Scenario by Benjamin Christensen based on a story by Stig Esbern. Cinematography by Merritt B. Gerstad; edited by John W. English. Director: Benjamin Christensen. Shown at Cinevent 35, Columbus OH, May 2003. After a notable career as a director and actor in his native Denmark that included the controversial Häxan: Witchcraft Through the Ages, Christiansen was brought to America in 1926 by MGM, where after completing two films, The Devil’s Circus and Mockery, and working on The Mysterious Island (begun by Maurice Tourneur and completed by Lucian Hubbard), he moved to First National. 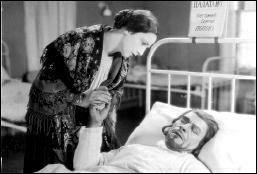 Chaney plays Sergei, a brutish peasant who rescues the Countess Tatiana (Barbara Bedford) from revolutionaries, helping her to escape to Novokutsk to deliver a message to the Czarist forces. Sergei falls in love with Tatiana and she, in turn, falls in love with a Czarist officer (Ricardo Cortez) who arrives in time to save her from the Bolsheviks. Chaney learns to hate the aristocrats but can’t overcome his love for Tatiana and sacrifices his life for her. Chaney, almost unrecognizable in his effective makeup, gives a nuanced performance, one of his strongest in a non-genre film that I’ve seen. I didn’t detect any of the stylistic flourishes for which Christiansen’s horror films are known, but his sensitive handling of the fine cast is, perhaps, a testament to his own acting skill. I wondered if the editor is the same John English who co-directed, with William Witney, some of Republic Studio’s finest serials in the late 1930s. IMDB says yes. I was wondering the same thing myself about John English. Well, that’s what IMDB says. As I understand it, the consensus at the time of the Cinevent showing was that they were two different John English’s. Strangely enough I went to high school with another John English. He father ran the town’s cigar shop & newsstand, a half-sized store off the main hotel. I spent a lot of time there in my younger days, but it’s long gone now. I’m not a horror fan, and Haxan is not my cup of tea. But one has to admit it’s original and vigorously styled. I think that “Charley, almost unrecognizable…” should be “Chaney.” Steve, I guess you overlooked my gaffe. I’m not able to go to Cinevent this year, thus breaking a 37 or so year record of consecutive attendance, but this review is a reminder of the fine films I would never have seen if I hadn’t been a Cinevent regular. Not your gaffe, Walter, but mine, sort of. You had it right in your DAPA-Em zine, but when I scanned it in, “Chaney” in that one instance became “Charley,” and I never spotted it. Nor would a spellchecker catch a mistake like that, and of course mine didn’t. In any case, I’ve fixed the oversight on my part, so terribly obvious once you see it. I was wondering if were going to be able to go to Cinevent this year — next weekend in fact. I’m sorry to hear that you won’t. But thanks for letting me share these old reviews with the rest of the world. Silent films in particular constitute a huge gap in what I know about movies, and I learn a lot from every review of yours that I post. Just watched Mockery on TCM, never heard of it before, but am fascinated. Surprisingly sophisticated in its treatment of the opposing sides in the Russian Civil War, suggests the moral and political ambivalence of the much later Doctor Zhivago. 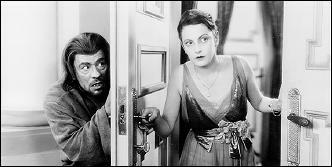 Sure, the overacting of the silent film era is a little hard for us moderns to relate to, but I loved Chaney’s sensitive portrayal of the Russian peasant, and was touched by his sad ending. Bedford was striking as the lovely Russian countess whose good heart sometimes overcame her natural elitist cruelty, reminding us of the hopeless idealism of the WWI Russian Women’s Death Battalion. There is also a sense of Donald C. Thompson, brilliant early American film maker and vivid anti-Bolshevik, who crafted several films on WWI and the Russian Revolution and glorified the Russian Womens Death Battalion.